Following are the comments to ICAR Open Access Policy Draft 2013 from the Open Access India Community. As 23rd May 2013 is the last date for sending the comments/suggestions. You are requested to share your suggestions below the post and same would be incorporated in the final submission to the Indian Council of Agricultural Research (ICAR). Policy: All ICAR institutes to setup their Open Access Institutional Repository using Free and Open Source Software which is of Open Archive Initiative (OAI-MHP) complaint. Suggestion: All the constituent establishment institutes of the Indian Council of Agricultural Research (ICAR) institutes to set up their Open Access Institutional Repositories (OAIRs), Open Access Data Repository for the datasets produced by ICAR and Open Educational Resources for educational material relevant to agriculture and related sciences using Free and Open Source Software (FOSS) systems which support the Open Archives Initiative Protocol for Metadata Harvesting (OAI-PMH) protocol for public good. Policy: The ICAR shall set up a central harvester using the free metadata indexing system to harvest the metadata from the OAIRs of the ICAR institutes and other repositories in the National Agricultural Research System (NARS) for the ‘one stop access portal’ of all the agricultural knowledge generated in the NARS. Suggestion: ICAR shall set up a central harvester to harvest the metadata and full-text of all the records from the OA repositories of the ICAR institutes for one stop access to all the agricultural knowledge generated in ICAR. All the ICAR institutes register their information products and services with the Coherence in Information for Agricultural Research for Development (CIARD)’s Routemap to Information Nodes and Gateways (RING) for their discovery across the world. Policy: All research and technical publications viz., research articles, popular articles, book chapters, books, monograms, catalogues, conference proceedings, success stories, case studies, annual reports, newsletters, pamphlets, brochures, bulletins, summary of the completed projects, class/lecture notes, presentations, photos, videos, speeches, keynote addresses, other digital objects and all the gray literature available with the institutes to be placed under Open Access. Suggestion: All the archives, current and future scholarly and grey literature viz., research articles, popular articles, book chapters, books, monographs, catalogues, conference proceedings, success stories, case studies, annual reports, newsletters, booklets, bulletins, summary of the completed projects, class/lecture notes, presentation slides, photos, videos, speeches, keynote addresses, patent grant publications, data sets etc., produced by the ICAR institutes/establishments to be made under Open Access. Policy: The authors of the scholarly articles produced from the research conducted at ICAR institutes have to deposit immediately the final authors’ version manuscripts of papers upon accepted for publication (pre-prints) in the institute’s Open Access repository. Suggestion: The authors of the scholarly literature/research outputs produced from the research funded by the ICAR at either ICAR institutes or elsewhere in the NARS have to deposit immediately the final peer-reviewed authors’ version manuscripts (post-prints) in the OAIRs or in any other appropriate Open Access repositories of NARS upon acceptance for publication. Policy: Scientists and other research personnel of ICAR working in ICAR institutes or elsewhere are encouraged to publish their research work with publishers which allow self-archiving in Open Access Institutional Repositories and required to submit the final manuscript of paper accepted for publication (pre-print) in the ICAR institute’s Open Access repository. Policy: Scientists are advised to mention the ICAR’s Open Access policy while signing the copyright agreements with the publishers. And the embargo if any should not be later than 6 months. Suggestion: Above points may be merged as: All the ICAR research staff, students and visitors at ICAR institutes are encouraged to consult the SHERPA/RoMEO database of publishers’ policies on copyright and self-archiving for publishing their research outputs in those journals which allows self-archiving in Open Access Repositories and are advised to use ‘Authors Addendum’ to the copyright agreements mentioning the ICAR’s Open Access Policy of mandatory deposit of post-prints while signing the agreements with the publishers. And the embargo if any should not be later than 6 months. Policy: Final reports of completed research projects and M.Sc. and Ph.D. thesis/dissertations to be deposited immediately in the institutes open access repository after completion of the work. The metadata (e.g., title, authors, publisher, etc.) be freely accessible from the time of deposition of the content and their free unrestricted use through Open Access can be made after an embargo period not more than 12 months. Suggestion: Final reports of the completed research projects and M.Sc. and Ph.D. thesis dissertations to be deposited immediately in the institutes open access repository upon submission and the metadata (e.g., title, authors, publisher, etc.) be freely available from the time of deposition of the content and made Open Access after an embargo period not later than 12 months. The Krishi Prabha, an electronic thesis and dissertations database of NARS be made Open Access and OAI-PMH compatible. 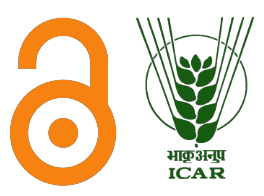 Policy: All the journals published by ICAR have been made Open Access. All the books published by ICAR and journals and books published by ICAR institutes are to be made Open Access. Policy: Journals, books, conference proceedings and other scholarly literature published with substantial support from ICAR (by professional societies and others) to be made Open Access by the end of 2013. Suggestion: Above points may be merged as: All the journals published by ICAR have been made Open Access and all the books published by ICAR, journals, books, conference/seminar proceedings and any other scholarly/grey literature published by the ICAR/NARS institutes and scholarly/professional societies with substantial funding from ICAR are to be made Open Access. Policy: DKMA to function as nodal agency for implementation of ICAR Open Access policy. DKMA will organise advocacy workshops and capacity building of scientific &technical personnel, repository administrators, editors and publishers on Institutional Repositories, application and usage of Free and Open Source Software. All the meta-data, full-texts and other records/data/information of the institutional repositories are copyrighted with the ICAR and are licensed under Creative Commons Non Commercial Share Alike (CC-NC-SA) for use, re-use and sharing without any warranty. Policy: The documents having material to be patented or commercialized, or where the promulgations would infringe a legal commitment by the institution and/or the author, may not be included in the institute’s Open Access repository. However, the commercial books authored on contract by the ICAR staff may negotiate with the publishers to share the same via institutional repositories after a suitable embargo period. Suggestion: The documents having material to be patented or commercialized, or where the promulgations would infringe a legal commitment by the institution and/or the author, may be exempted for mandatory deposit in the institute’s Open Access repository. However, the commercial books authored on personal contract by the ICAR staff may negotiate with the publishers to share them via ICAR OAIRs after a suitable embargo period. All the ICAR institute’s website content, print/digital publications, meta-data and full-texts in OAIRs be licensed for use under the Creative Commons Attribution-3.0 (CC-BY-3.0) Unported License and unless otherwise noted, the users are free to copy, duplicate or reproduce, and distribute, display, or transmit without permission, and to make commercial use of the work under the condition – Attribution — Users must attribute the work in the manner specified by the author or licensor (but not in any way that suggests that they endorse you or your use of the work). Suggestion: The Directorate of Knowledge Management in Agriculture (DKMA) to function as nodal agency for implementation of ICAR Open Access policy. The DKMA along with Agricultural Knowledge Management Units (AKMUs) in ICAR institutes and other agencies and communities would organise advocacy workshops and capacity building of scientific &technical personnel, repository administrators, editors and publishers on OAIRs, Open Access Journals and application and usage of Free and Open Source Software systems related to scholarly communications. GNU EPrints, Fedora Commons, DSpace etc. Agropedia, Rice Knowledge Management Portal, ETD@UAS, Dharwad, Krishi Kosh etc. Draft of a manuscript after it has been peer reviewed with revisions having been made. Period during which access is not allowed to the public.